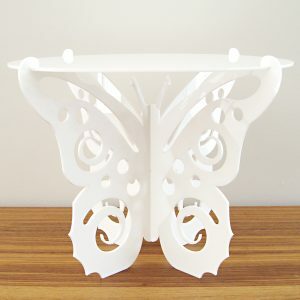 Transform your table into a magical garden with the Flutter-by Butterfly cake or cupcake stand. 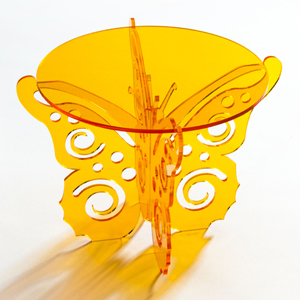 Transform your table into a magical garden with the Flutter-by Butterfly cake stand centrepiece. This design is delightfully whimsical and is available in any of our 14 stocked colours. 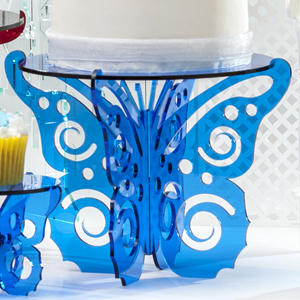 Depending on the hue chosen, your Flutter-by Butterfly centrepiece will complete the look you want to share with your guests. Picture it in black for a stylish silhouette or white for a bridal garden reception. Perfect for the young ones (or those young at heart), it would suit any birthday party! 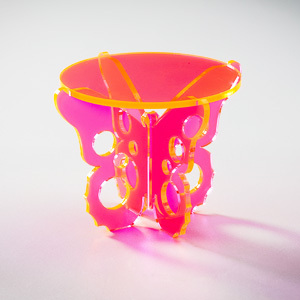 Cut from sturdy 3mm acrylic, the top plate is 17cm wide and nestles comfortably in the 20cm wide wings. It will hold 4 generous cupcakes or up to 10 mini cupcakes. Alternatively it will hold a 6 inch cake. Our flat-pack design means it can be assembled and disassembled in a flash and stored flat to use again and again for many celebrations to come.